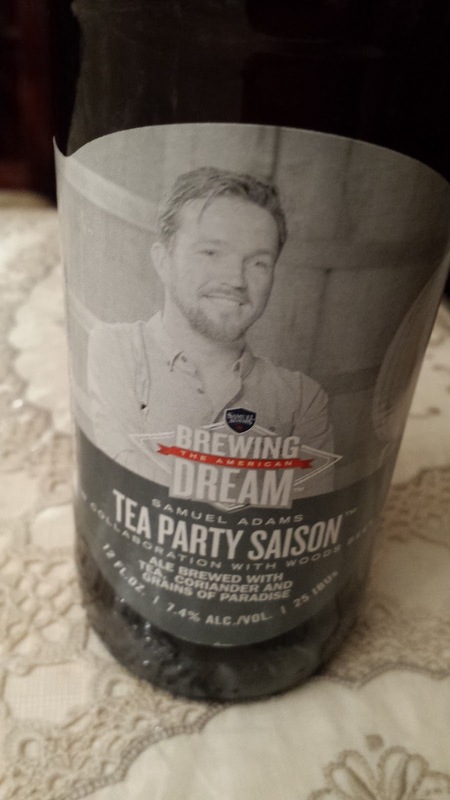 This week's Sunday Night Suds looks at another of the "Samuel Adams" Brewing American Dream series - the Tea Party Saison. The beers in this series were prepared in collaboration with five breweries. In addition to the Tea Party Saison, the other four beers are Three Ninety Bock (made with Roc Brewing Co.); Desert Kaleidoscope IPA (reviewed here http://kosherbeers.blogspot.com/2017/12/sunday-night-suds-samuel-adams-desert.html) which was partnered with Bosque Brewing; Time Hop Porter (reviewed here http://kosherbeers.blogspot.com/2018/01/sunday-night-suds-samuel-adams-time-hop.html) which was partnered with ChuckAlek Brewery and Oats McGoats Stout, (reviewed here http://kosherbeers.blogspot.com/2017/10/sunday-night-suds-samuel-adams-oats.html) which was partnered with Brewery Rickoli. (For a great article on the mentor program, click here http://www.chicagotribune.com/dining/drink/beer/ct-sam-adams-beer-mentor-program-20170717-story.html). The Tea Party Saison was made in collaboration with Woods Brewery and although it calls itself a Saison, it tasted more like a wild or sour ale. The beer has a high end alcohol content at 7.40% abv, but the alcohol flavor is not exceedingly strong. The beer poured a dark cloudy gold and I was unable to see through the beer in the glass. The yeast gave this beer somewhat of a lemon iced tea flavor, almost like a half & half iced tea. This was a decent change of taste, but I would not be interested in having another one of these. The Tea Party Saison is under the Kosher Supervision of the Star-K and has a Star-K certification mark on the bottle. To see what the experts on Beer Advocate think about this brew, please follow this link - beeradvocate.com/beer/profile/35/292909.